Why do I need Q-Bank? As your use of Xorro-Q continues, you'll find that your "library" of activities will grow. Each activity contains questions which you've worked hard to produce... and the answers to which have yielded value from your participants. Initially, you might be content to leave the questions inside of the activities in which they were created. Eventually however, you'll get frustrated with this: It's hard to find a question you remember having created, if you don't know in which activity to look; even once you've found it, its awkward to actually do anything with the question (such as copying it into a new activity). Also, although you can share your complete activities with other facilitators, this is not very efficient in comparison to letting them find exactly which questions are most suited to their needs. You will find it simple and intuitive - and quick - to use Q-Bank as your organising and searching tool. You'll soon become adept at finding previously created questions (whether your own or others'), and dropping these into your new activities. Saving your questions into your Q-Bank When you first visit the Q-Bank tab you'll find an empty library. This is because you have not added any questions yet from your activities. To get started with some content, it's best to make use of what you've already created using activities (i.e "Import from Activities", or to import a list of question in CSV format. You could also of course search (globally) for shared questions. To get started, press the "Import from Activities" button. The resulting import wizard is self explanatory and guides you through selecting the activity, and from within that activity selecting the questions you want to import. It's best to select questions which you anticipate placing into a common Q-Bank folder.... so you might not want to just select all the questions in the activity at once. Pressing the "Next" button takes you to a form in which you categorise all of the questions which you have selected. 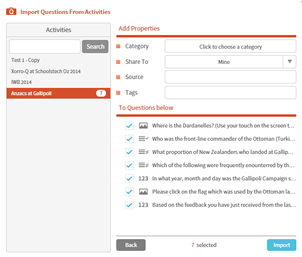 Category: Using Q-Bank, you can choose to organise your questions into traditional education subjects (maths, sciences, arts etc) and in some cases into sub-categories.You won't be able to change the labels of these top two levels, however you can add your own customised labels at lower levels of categorisation. Alternatively, you are also free to use the "Other" category which is completely open for you to customise. Share to: In Xorro-Q, you automatically save your content into your own Q-Bank. This is not shared with anyone else. If you choose, you can expand the circle of people allowed to access specified question, by selecting "My institution" (which will share with any facilitator in your institution), or "Global" (which will share with any Xorro-Q facilitator around the world). Tags: This is the critical bit. Xorro-Q will of course search question text and options etx etc... however, especially for questions relying on media or images, this is not enough to easily find the question when you want it. Enter here some descriptive keywords which you might expect to use when searching for this question later. Searching for questions Using Xorro-Q to search for questions couldn't be easier. Below the Categories section on the left side of the page you will observe the search functions (pictured, right). You are searching for keywords which you expect to find either in the body of the question, or in options, or in keywords attached to the properties of the questions. 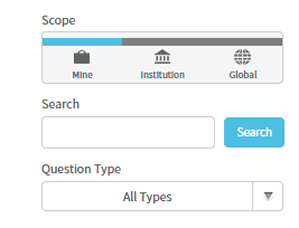 By adjusting the scope of your search, you can choose to search just within your own Q-Bank, or you might add in search results from Q-Banks shared by other facilitators (either from around your Institution, or globally). You can filter the search to identify particular types of questions, or you can pre-select a Category to search only for questions within that category. Sharing It follows that by sharing your questions, you will be returning the favour to those who share questions with you. Your questions don't need to be "perfect": they just need to be useful enough to provide a starting point for whoever finds them. This starting point may be no more than inspiration! You can of course, decide how widely you want to share questions, and you can be as selective as you like around which items are shared and which are not. Often, sharing may be determined by what copyright you hold. If you did not create the questions or are uncertain of the copyright in them you might be uncomfortable to share the questions more widely than with others in your workgroup (your institution). Resources: See the User Manual for the full story; the Quick Reference Guide covers key points in just 2 pages. Coming up: In the last installment of "Xorro-Q in 7 Bites" we'll be checking out how to recover Results and how to interpret the various Reports available from Xorro-Q. These support assessment data from the session itself, as well as participation data which can provide insight into opportunities to improve engagement. As always, feel free to read ahead!